Oakland’s newest commodity won’t be the first in the neighborhood to house books and records under the same roof — but it will be the first to add a vegan cafe. It’s a quiet, rainy day, with an indie rock vinyl spinning on the record player in one of the corners — it’s audible, gentle and warm, subtly filling the small used bookstore. The music breaks any presupposed silence as three students chat, laugh and browse the shelves. Amazing Books and Records opened on Oakland’s Meyran Avenue in November, bringing with it a planned vegan cafe and an accumulation of gently used books, textbooks and vinyl records for cheap. Moving in adjacent to Peace, Love and Little Donuts, AB&R’s cozy bookish atmosphere offers students a local alternative hangout that Caribou Coffee and then Peet’s Coffee couldn’t maintain, both leaving a still-vacant property across the street from Starbucks on Forbes Avenue. The first AB&R location opened in 2013 on Liberty Avenue, Downtown, and a second in 2014 on Squirrell Hill’s Murray Avenue. Besides selling books and records in the new Oakland spot, owner Eric Ackland is looking to incorporate a vegan cafe and coffee shop, a first for any of his places of business, later this year. As a bookstore-eaterie hybrid, AB&R will introduce coffee, espresso, vegan milks and treats like chocolate chip cookies. “There’s plans for where things will go, there are already vegan recipes being tossed around,” Elly Rasile, an employee at the Oakland store, said. After its restaurant license is approved, the vegan cafe will eventually include a refrigerated case, equipment to make coffee, juices and smoothies and a bar with seats for customers to sit in, read, eat or drink at between classes or while studying on the weekends. Ackland would like to eventually incorporate an assorted menu of vegan sandwiches, local fair-trade coffee and handmade vegan pastries into his Oakland store, hoping for a three-peat mention as City Paper’s Best Local Bookstore, which his Squirrel Hill location won last year. “My wife has some recipes that she’s created for amazing vegan desserts,” Ackland said, “We’ll have a convection oven and bake the pastries on the spot. If it’s working, we’ll add salads, soups [and] hot entrees,” he said. If the cafe proves successful, Ackland hopes to implement it into his other stores, but for now, it’ll be an Oakland specialty, distinguishing it from other local-minded book stores in the neighborhood like Caliban Book Shop, which also sells books and records. But with Atwood Street’s Slipped Disc closing its doors last summer and Jay’s Bookstall, once a well-known independent bookstore on Fifth Avenue, closing in 2008, AB&R fills the need for both vinyl records and an affordable, local book outlet. The record tables toward the center of the AB&R are mostly old favorites from across genres — Billy Joel and Carly Simon, Prince, Duran Duran, Jimi Hendrix and Chicago — and they even stock Tchaikovsky and Stravinsky. 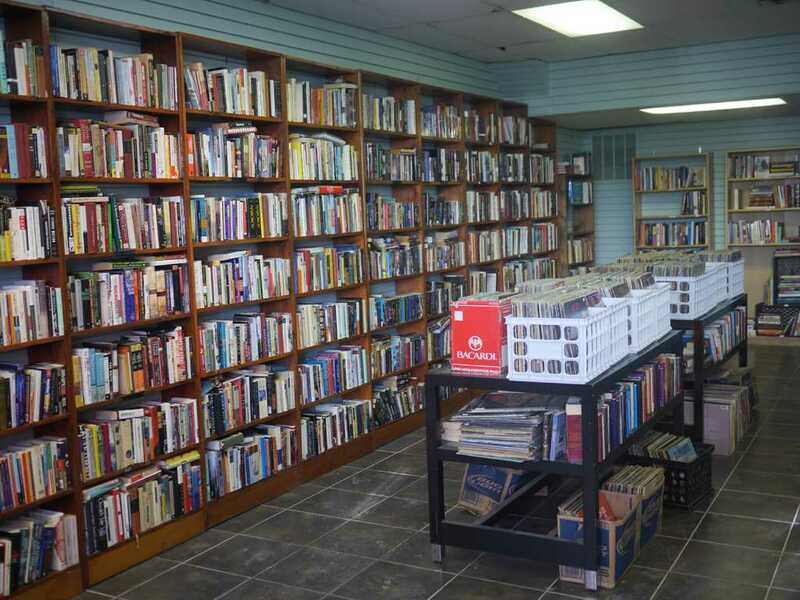 Despite being considerably smaller than the locations Downtown and in Squirrel Hill, the Oakland store displays about 2,500 books and 1,500 records—enough to satisfy a wide variety of tastes. There are strong representations of both popular and scholarly works along the left side of the store — a wall of books, floor to ceiling. AB&R displays all of its merchandise in one neat, spacious room. To explore the stacks, customers have to descend a small staircase just inside the door. There are three walls of shelves and two tables in the center of the store. Natural light pours in from the wide window that takes up the fourth wall and the entranceway. Even though AB&R is located in the center of a heavily student-populated area, the store has already attracted a diverse clientele. “Many are students, but there are others,” Rasile said. “Medical workers will come in on their lunch break[s], or native Pittsburghers will come in and ask about a record,” she said. Novels and poetry books crowd the shelves near the entrance. Biographies and histories are in the middle, near the tables, and gender studies and psychology are toward the back. Philosophy and art history are on the right side of the store, near the record player. As a sound rival to digital textbook and literature inventories like Amazon or Half, AB&R has a pleasing mixture of new and old literature. The collection of plays is notable, spanning from Aeschylus to Wilson. Authors John Green, Suzanne Collins, Amy Tan and Dean Koontz have prominent presences, as well as C.S. Lewis, Leo Tolstoy, W.B. Yeats and Charles Dickens. AB&R buys textbooks and recreational books for cash, and it will offer an even larger sum in store credit. Ackland often biked through Oakland before bringing his store to the neighborhood, which he said he has wanted to do since he opened his first location Downtown. “That strip of Forbes from Meyran to Oakland was always happening, at all hours of day and night,” Ackland said. “We’ve kept an eye on Oakland, [and] finally something became available,” he said. As a store aspiring to distinguish itself not only from its neighboring shops in Oakland but also from its fellow locations in Squirril Hill and Downtown, Rasile thinks Meyran’s AB & R is going to flow seamlessly into the community.